However, there is no way to do this from C#. I have seen a couple of solutions now where it calls for an XLAM (Excel Add-in) to be placed in the XLSTART folder that can be used to register these textbox clicks and then call into your VSTO DLL through COM.. a la early-binding. One thing I tell customers all the time is to not mix and match VBA and VSTO. Choose one or the other. This is because you can get into some real sticky situations that are downright impossible to debug. When a left mouse click is detected it fires an event that the caller hooks to. NOTE: This property is not normally exposed in VSTO (for some reason). However, it is accessible via VBA so I know it is there. 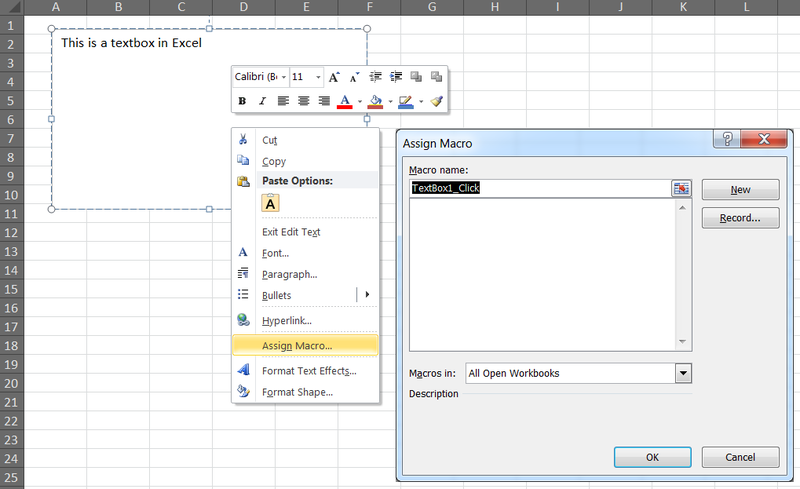 Therefore, to get at it, I have to pInvoke it from Excel. /// Remove the hook on close. // but specificaly looking for mouse events. /// Is called by Windows when a Mouse event occurs. // is there a code passed? /// Turn off the hook. There it all is. Now the real beauty is that you can actually use this code to detect the user clicking on all sorts of things, not just a textbox. To handle other Mouse events like MouseMove and Mousewheel, do you use the same code structure? Also, is there another piece of code to specify that OnMouseActivity.Invoke(this, args1); calls hook_OnMouseActivity? I have not tested using Wheel or Move, but this methodology you outline looks sound. I am not sure if the callback is exactly the same, since the Wheel move would likely have some value indicating direction and amount, but I am sure that can be found on MSDN.